Who is God and what is He up to? How does He operate, what does He want? Is God mad at me? Is He testing me or judging me? Does God allow bad things to happen? Does He change His mind? What is God's wrath and how does He act on it? What is Truth and who defines it? The sophistication of today's technology might overwhelm you with a sense that all of the answers to questions about Life and your Life's Purpose are answered in the truth of science and technology. For example, Einstein's Theory of Relativity helps us understand some of the mysteries of science and nature. In like manner, our Relative Perspectives are key elements to our understanding of the spiritual world around us. Ideolatry is placing the human intellect on a pedestal and worshiping its potential. It can severely diminish one's ability to be completely fulfilled. Personal Ideolatry can skew your Perspectives due to your Life Filters. Those Filters are created through your Observations and Experiences. These Relative Perspectives, built on our observations and experiences, also explain why we have different versions of truth. Our version of truth forms the foundation of our understanding of God and His Word. It influences our faith or lack thereof, and our relationship with God. But, if God is not my problem, then who is? The Ideolatry E-Book Version is an interactive reproduction of Ideolatry. Appendix references are linked along with 74 cross references linked to the Endnotes pages with return links. The 439 Scripture index entries are linked to each appearance in the book. The vibrant color illustrations and tables are faithfully reproduced along with the Words of Jesus in Red. The Ideolatry E-Book is available in 4 versions, specifically formatted for Kindle, iBooks, Nook and Generic eReaders. Download and installation instructions are included for each device. The E-Book is a convenient way to explore the Ideolatry content and saves shipping costs as well. Combine with the Study Guide for the best learning experience. IDEOLATRY takes the This 128 page comprehensive Study Guide is a companion to the IDEOLATRY Book. It is intended for individual or group study to enhance the reader's understanding. Exercises include fill in the blank, multiple choice and thought provoking personal responses. Free Answer Key available in pdf format. The Study Guide is also available in combination with the Book or E-BOOK for a special bundle price. 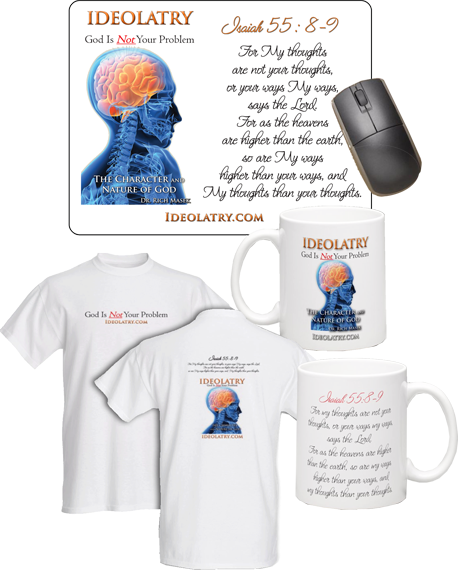 Keep the Word Of God close in your study time with these IDEOLATRY products. Isaiah 55:8-9 helps to remind us that God's thoughts are above ours and the IDEOLATRY that can sometimes overtake us. Get your own Mouse Pad and Coffee Mug for your study time. Get a T-Shirt to spark a conversation about this strange word, IDEOLATRY and share God's love with those you meet. The front of the "T" proclaims that God Is Not Your Problem, to begin the conversation. As you leave, the back of the "T" proclaims Isaiah 55:8-9 to remind readers that God's thoughts are higher than theirs. Any of these products are great for gifts and sharing God's Word. "Dr. Masek has a unique ability to condense complex thoughts into an easily understood format. He has a gift...and a mission to help all of us understand our relationship to God in today's secular world. I hardily recommend this book as it will deepen your understanding of your purpose in life. It is well written and philosophically challenging." "Your book is amazing. I have been empowered with your insights. It has increased my passion to read the Bible. I am more focused on filling my discussions with God's absolute truth. The book is clear and easy to follow. You are a great teacher and my family is blessed with the knowledge you are sharing in your book. Really! I enjoy how you methodically break down the factual meaning of scripture. Every chapter has been a really good read. Every recent discussion your material has greatly helped clarify who God really is. Very powerful! People really need to hear the truth about that to have a deeper relationship with Jesus. Appreciate you so much...!" "Ideolatry has opened my eyes to the TRUE nature of God, His love mercy and grace. If you've ever thought God has brought calamity or difficulty in your life....whether you think you deserved it or not, you need to read this book! The first chapter in you'll be rethinking what you thought you believed. Ideolatry is about our Father who loves us....and if you're a parent, you can relate as you think about the love you have for your children. What I found in this book is that my Heavenly Father loves me just like I love my children." "Wow .. definitely an eye opener! A must read!"